Weapon description: LASER (Light Amplification by Stimulated Emission of Radiation) weapons deliver a large quantity of stored energy, thus obliterating their targets. A directed energy weapon (ray gun) delivers its effect at the speed of light, rather than supersonic or subsonic speeds typical of projectile weapons. 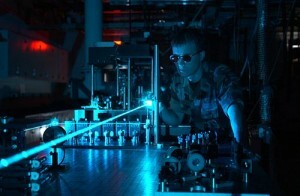 The LASER was conceived in 1957, but not constructed until 1960. Although there was an immediate military interest, LASERS as weapons hasn’t happened until recently.